Winter time,strawberry season has hit the market again.I was longing for the strawberries and finally my son came with a box of it yesterday and I was very happy to see it,not that I love the fruit but I just admire its beauty and color,since red is my favorite color.And they were luscious and juicy ones.Few years back we used to get to see this beauty only in Bangalore or Mumbai,and we would not miss the chance to get the stock from there,but now its is abundant in Mangalore too.Strawberries are the most popular fruit and they are rich in Vitamins.They are most commonly cultivated in the cool places.They are also the good source of iodine and are packed with Vitamin C.Coming back to the recipe I adapted this recipe from Sanjeev kapoor’s Book.I have already posted the recipe on Rosy phirni and Phirni.So the recipe goes the same way,only difference is we add the strawberry puree for the flavor as simple as that.Same way you may prepare other fruit phirnis like mango,chickoo or may be even grape just by doing puree or adding the chunks. Soak rice for about half an hour and grind it coarsely without adding water. Dissolve the paste in milk and make it very thin. Boil the milk in the heavy bottomed pan. Add sugar and stir for few minutes. Add the rice paste and cook on medium flame stirring continuously. The mixture will turn thick,lastly add strawberry puree and give it a stir. Pour the mixture into the serving bowl. Garnish with almonds and strawberry slices. Always remember to add the strawberry puree in the end or else the milk will curdle,since strawberries are sour(personal experience). 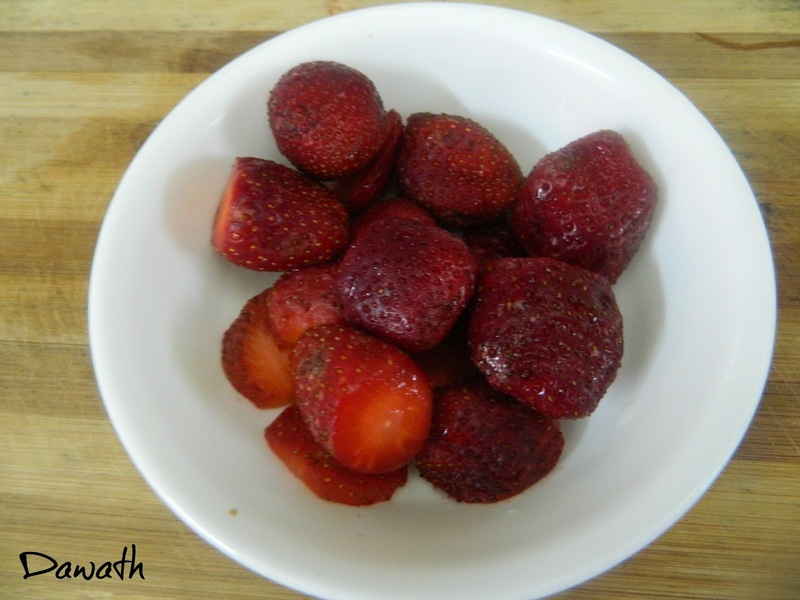 You may also add chopped strawberry pieces instead of puree or add both. 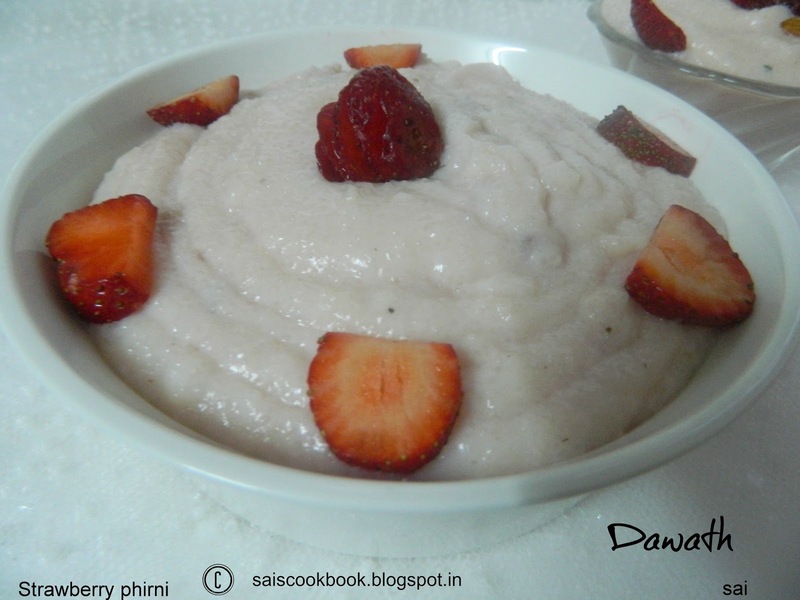 If you feel the phirni is thin dissolve 1-2 tsp of rice flour in milk and add. 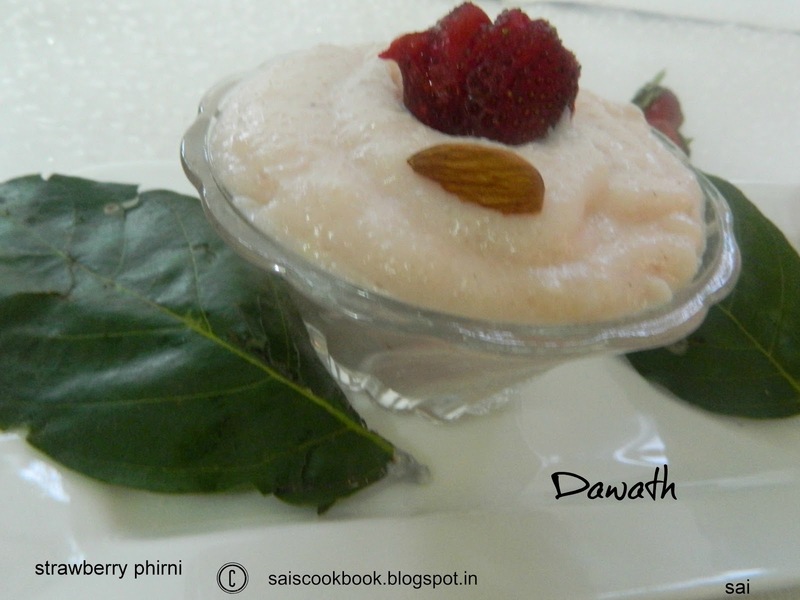 If you feel the phirni has become thick add milk and add adjust the consistency.